so santa really is spying like the NSA? happy hollidays guys and just as constantine wrote: may santa bring you all of the models you asked for! No, Santa is an Inquisitor. He wears red and carries a bag of presents (or grenades if you are not nice). Enjoy your holidays. Happy hollidays and Merry Christmas to all of you !! I've got a Citadel mini of Santa Claus with a bazooka... Since then i'm quite sure he's a monodominant Inquisitor !! Merry Midwinter. Unless you're in the Southern hemisphere. May you have a good time, eat some really nice food. And perhaps even get a thing or two! Over here we're about to enter summer, and a very hot one! 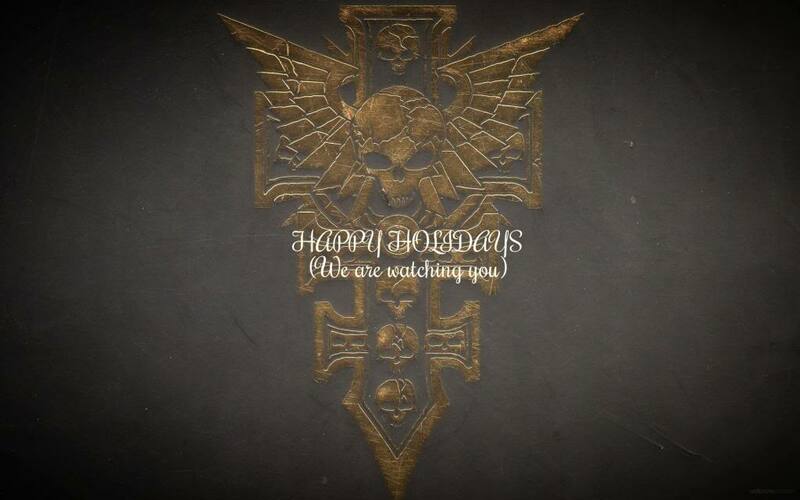 But the spirit is there so Happy holidays to all of you, may you enjoy them in company of your loved ones, and may you recieve many gifts to bolster the best army in 40k (at least for me): Grey Knights! Do you think that Christmas and new years are still celebrated by secret cults in 40K? DonFer wrote: Over here we're about to enter summer, and a very hot one! But the spirit is there so Happy holidays to all of you, may you enjoy them in company of your loved ones, and may you recieve many gifts to bolster the best army in 40k (at least for me): Grey Knights! Yea Merry Christmas and a Happy New Year to all. Waiting to move house again before I can set up all my 40k so I don't think I'll be getting anything on the gaming front for Christmas - got too much backlog! Constantine wrote: Do you think that Christmas and new years are still celebrated by secret cults in 40K? FORMED FROM PURE EVIL, ATTACKING. LIKE THE ONE STANDING HERE. FOR THOSE WHO STOOD ALONE. ON A PLANET FAR FROM HOME. TO JOIN IN THE FRAY. FROM HIS MOUTH I HEARD TRULY. ON A BLOODY RED HILL. A GREAT VICTORY HE’D WON.